Sara lives isolated in a large house hidden away from a nearby village, with her workaholic husband and two sons, the youngest of which is autistic. The family also have a pet dog whose constant barking, unsettles adding to the tension of the household. One day Sara meets Katie, a college student doing a bit of dog-walking as a way to make money. Katie starts walking Bundles, the family dog, and so Sara befriends the young woman. She soon becomes her gateway into the village community, because Katie seems to know everyone; and so Sara starts to make new friends. This book opens with the familiar territory of the classic psychological thriller – timid wife, cut-off from family and friends by an apparently manipulative and abusive husband. But it eventually becomes clear that all is not as it seems, and we can’t believe all we are being told. The narrative is initially a slow burn, and it’s hard to like any of the characters; but soon an unease sets in, like a worm in the brain, and I found myself engrossed, wanting to keep reading to uncover where the narrative would lead. Despite my own suspicions about what the twist was going to be - it still hit me hard when it arrived unannounced. When I reached the climax, I found the tale had wriggled under my skin, where it remained with me, for quite some time. It’s difficult to reveal more without giving away spoilers, as you really need to go into this one cold, without knowing too much about it before cracking its spine. 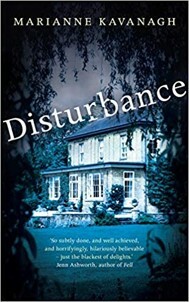 Suffice to say, fans of psychological thrillers, unreliable narrators and tales with twist endings should add this one to their ‘must-read’ pile.